When we built this city, we didn’t go down the traditional route of bricks and mortar. We didn’t go for the currently in vogue technique of Rock and Roll. We didn’t even use jam and scones. Instead, we got out our old Lego bricks and started building that way. Sure, it took a long time to build the city, but since it was funded by the government they didn’t seem to mind that we we over budget and over schedule – what we came up with in the end was pretty, if a little bit uncomfortable to walk around on in bare feet. 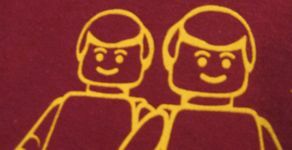 I’m a big fan of Lego, so any shirt showing a minifig is immediately going to score extra points in my book. Add to that the use of Starship’s “We Built This City” and we have a winner. The shirt isn’t over the top, using a simple single colour print. The print colour is Lego minifig yellow, and the typeface is the classic Lego font. Add to that the fact that the minifigs are the modern era “simple” minifgs that I grew up with and this shirt quickly became a must have for me. 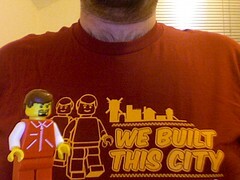 “We Built This City” is printed on a red American Apparel t-shirt and is sold by Busted Tees for $18.99. It comes in both male and female sizes.